Trump's top Israel adviser an alumnus of Gush Etzion yeshiva, supporter of Jewish rights in Judea and Samaria. (JTA) If Donald Trump wins the White House, he’ll probably be the first U.S. president whose top adviser on Israel used to do guard duty at a Jewish community in Judea and Samaria armed with an M-16 assault rifle. The adviser, Jason Dov Greenblatt, currently works for Trump as a real estate attorney. Trump identified Greenblatt last week as one of two Jewish lawyers who would be his top Israel advisers; the other is bankruptcy expert David M. Friedman of the Kasowitz law firm. Friedman is also a regular Arutz Sheva columnist. Greenblatt, 49, has an unusual resume for a prospective presidential adviser on Middle East affairs. An Orthodox Jewish father of six from Teaneck, New Jersey, who wears his yarmulke at work, Greenblatt has worked for Trump for the last 19 years dealing exclusively with real estate and company matters. His titles are executive vice president and chief legal officer. He has self-published three travel books, one about a family trip to Israel, and runs a blog about family travel, Realfamilytrips.com. As Trump’s campaign for president has intensified, the Republican front-runner occasionally has tapped Greenblatt on Israel-related matters. Greenblatt says he was among those who helped Trump prepare his speech to the AIPAC conference in Washington in March. And when asked by JTA several days ago for a surrogate to write an op-ed in support of the candidate -- JTA approached all the campaigns for surrogate op-eds -- the Trump campaign turned to Greenblatt. Greenblatt’s positions on Israel are similar to those of his boss. Like Trump, Greenblatt supports a two-state solution, so long as it is reached by the parties themselves and not imposed by an outside body like the United Nations. He does not believe Jewish communities in Judea and Samaria are a core part of the problem. He says Trump, an “incredible facilitator,” should try to restart peace talks. To get the Palestinian Authority to the negotiating table, Greenblatt suggests threatening to withhold US foreign aid. Also like Trump, Greenblatt believes Israeli-Arab negotiations can be handled similarly to Trump’s real estate negotiations, with money as a main incentive. 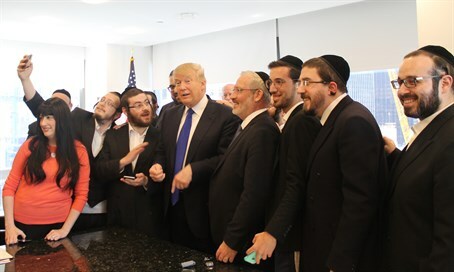 Partway through a meeting with Orthodox Jewish reporters, Trump noted that he had plenty of Jewish friends, and then asked his campaign manager, Corey Lewandowski, to bring Greenblatt and another Orthodox Jewish employee to the room. Shortly after they arrived, Trump was asked about his views on Judea and Samaria. He punted the question to Greenblatt. Raised in an Orthodox neighborhood of Queens, Greenblatt is a product of Orthodox Jewish day schools. He went to Yeshiva University’s high school for boys, the Marsha Stern Talmudical Academy, and then to Yeshiva College after a year of study in the 'West Bank' yeshiva. He obtained his law degree from New York University and worked for a law firm doing real estate transactional work – and tried to launch a start-up cappuccino company -- until a recruiter brought him to Trump. Greenblatt said Trump has been hugely understanding about his religious needs (Trump’s daughter, Ivanka Trump, converted to Judaism before marrying husband Jared Kushner, and her family is involved in Orthodox observance). Greenblatt recalled the time he was leading a complex negotiation when he sheepishly told Trump he had to stop everything for a three-day Jewish holiday.